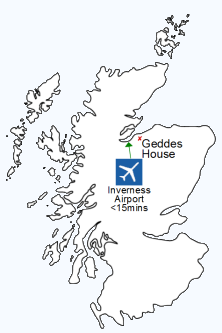 Geddes House has hosted house and shooting parties from all over the world for many years. Each one is tailor-made so it's exactly right for you. Additionally, we host fishing holidays utilising our own trout fishery, golf holidays taking advantage of many wonderful local golf courses in Highland and Moray as well as all sorts of large-family gatherings. We are happy to help with arrangements of shooting and hunting, golfing, fishing, clay pidgoen shooting and many other local activities. Eating at Geddes should be a highlight of your stay. Catering is available in many formats, we can leave you to yourselves, stock the feezer for your arrival or even offer a chef to come to the house for a full-catered service for all or some of your stay. "What a fantastic, relaxing and luxurious few days. And what a wonderful, warm, homely atmosphere. Thank you – we will be back"